The White elephant gift exchange is always a great time. Sometimes it's hard to come up with something to bring since I don't really get gifts from people. So this year I decided to "re-gift" stuff that I was supposed to gift and never did or stuff I made that I just don't have any use for. 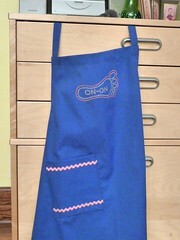 I had made this apron for Chuck because he said he'd like one after seeing the one I made for DH; well then Chuck sort of disappeared for a long time and the darn apron was hanging in my closet. 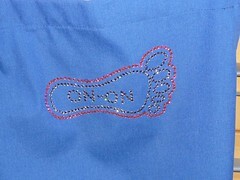 So I decided to add an On-On Foot in rhinestones and sew on a pocket and gift it. This was my first rhinestone design although I can't take full credit since I got the idea and really the perfectly laid out template from this site that just happened to be using the Hashing foot as an example. The other things I included in the box where 2 eyelash scarves, the Christmas tree small pillow decoration thing, the clover hot pad, the love/hate hot pad, the Sam Adams hat and scarf set, the bunny baby hat with with misplaced ears and the wee-willy warmer that never made it in the gift box last year. I think that's it.